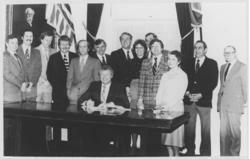 The 30th anniversary of the signing of Vermonts captive insurance legislation will be celebrated in Burlington led by Governor Peter Shumlin at a reception in the historic Union Station on Burlingtons waterfront. The event is co-hosted by the State of Vermont and the Vermont Captive Industry Association (VCIA). Former Governor Jim Douglas will also be in attendance for the event. I am delighted to invite the captive insurance industry to join us in celebrating three decades of service that has resulted in Vermonts leadership position as a domicile, said Governor Shumlin. Governors and legislatures since the signing of the law have come together to support this industry, and I am pleased that former governor Jim Douglas will join me on this special occasion. Vermonts captive insurance law has been called the gold standard by trade press for its consistency in keeping pace with the changing needs of the industry over the past thirty years and it has been used by other domiciles as a model of regulation. Captive insurance is a regulated form of self insurance that has existed since the 1960s and has been a part of the Vermont insurance industry since 1981, when Vermont passed the Special Insurer Act. Captive insurance companies are formed by companies or groups of companies as a form of alternative insurance to better manage their own risk. Captives are typically used for corporate lines of insurance such as property, general liability, products liability, or professional liability. Growth sectors of the captive insurance industry include securitization, professional medical malpractice coverage for doctors and hospitals, and the continued trend of small and mid-sized companies forming captive insurance companies. The 30th anniversary Vermont captive insurance event will be held on Wednesday, June 22 from 4:30 to 6:30 p.m. in downtown Burlington’s historic Union Station. Sponsors of the event include Primmer Piper Eggleston & Cramer PC, Paul Frank + Collins Attorneys at Law, and Downs Rachlin Martin PLLC. Vermont is the largest captive insurance domicile in the U.S. and the third largest in the world, with an excess of $ 25 billion in gross written premium in 2010. Vermont is also home to 42 of the companies that make up the Fortune 100 and 18 of the companies that make up the Dow 30. For more information on Vermonts captive industry, visit VermontCaptive.com or call Dan Towle at 802-828-5232 or email Dan.Towle(at)state(dot)vt(dot)us.